(Nanowerk News) Physicists at the University of York working with an international team of researchers, have shifted their focus from defects in bulk crystals to those in ultra-thin crystal sheets of only one atom or one molecule thickness (Nature Communications, "Exploring atomic defects in molybdenum disulphide monolayers"). 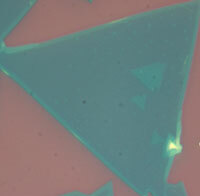 A micron-scale optical microgram showing a characteristically triangular molybdenum disulphide ultrathin film grown in York. Following the discovery of graphene, an ultra-thin wonder material made of a carbon sheet of only one atom thickness, a number of other ultra-thin membranes have become the focus of study by nanotechnologists. These ultra-thin materials can be used not only to study physics in ‘flat land’ but also can be used as building blocks to produce ultra-thin or artificially stacked and flexible electronic devices. Using sophisticated high-resolution electron microscopy, the researchers, who included scientists from Zhejiang University in Hangzhou, Beijing University, Reming University and Chinese Academy of Science in Beijing, China and King Abdullah University of Science and Technology in Saudi Arabia, have scanned these two-dimensional sheets for defects with resolution down to the atomic scale. They have discovered that atomically thin molybdenum disulfide (MoS2) sheets have different ‘personalities’ or dominant defects depending how they are produced. If the atomically thin sheet is cleaved from minerals or grown by chemical reaction, then the dominant defects are loss of sulphur atoms from the crystalline structure. On the other hand, if the atomically thin sheet is grown by direct evaporation of bulk MoS2, then the dominant defect is the so-called anti-site type with molybdenum atoms replacing sulphur atoms in the crystal.